Opinion (Nikolai Kashcheev, Senior Director, Head of Corporate Department, Promsvyazbank, Russia): “The world today is at a breaking point, not in favor of the systems that continue to live under the laws of tradition. Directions, trends change. Now, progress is achieved only by joint efforts of people from all over the world. “The fruits of that progress are successfully used only because technology and knowledge flow from one laboratory to another, from one country to another. These trends continue to work on the creation of the horizontal global economy. “For this to effectively pass from the system of defense or scientific laboratories into our daily life, the following is needed: a) the capitalist system, based on profit and b) globalization, when efforts can be concentrated, while being distributed. “This works in finance through crowdfunding and crowdsourcing. By being closed, we will fail, which has already happened today to several obsolete economies that may serve as a warning. My Comment: The main thing is to understand that only unity can lead us to the next stage of development. And unity should be not capitalistic, but altruistic. But this understanding will gradually come. Question: When does a person attain faith in the Creator, which is evidence that he is on the true path? Answer: Faith must always be renewed on every new level. Faith is bestowal, the level of Bina, Hafetz Hesed, bestowal for the sake of bestowal, making it possible to rise above our desire to receive. This is what is called faith in the Creator. I raise myself above my desire to receive, above the Tzimtzum, to the level of Bina, to bestowing in order to bestow. That is how I direct myself completely towards the Creator. In the meantime, I cannot use a desire to bestow; I cannot sit at the table of the host and enjoy all the tastes, feeling that I enjoy him. I carry out my preliminary corrections, rise above the Shoresh, Aleph, Bet, Gimel, Dalet phases of Aviut by wanting to be above my desire, and direct myself only towards the Creator. I look only at Him. Seductive smells rise from the table, but I look at the Creator. Even though I feel how tasty the tastes are, the Creator is more important to me. I don’t forcefully stop myself because I am ashamed to take from the table. The Creator simply becomes so important to me that I need to choose between Him and the dish. This is called levels of faith. I prefer to aim towards the Creator instead of aiming towards the dish. This decision is made in the 4 phases of Ohr Yashar (Direct Light), Bina. Psalm 95:1-2: “O come, let us sing unto the LORD; let us shout for joy to the Rock of our salvation. In each and every generation, meaning in each and every state, it is necessary to get up again, to take heart and to continue advancing towards the higher power. Despite the despair that is felt in the receiving Kelim, we must discover in our correction, in the power of bestowal, that the Creator is good and benevolent. And the moment we advance on the left, which in the meantime is called heaviness of heart by us, we feel bad and immediately sink into this feeling. Instead we must rise above it specifically thanks to this unpleasant emotion in the desire to receive, the lack of elevation, the lack of spirit, the lack of energy and importance of the goal. But instead, we fall under the control of despair, fatigue, and concealment, and we submit to this enemy, our desire to receive. It weakens, subdues, and topples us so that we are not ready to move out from this place and are humiliated. Here we must get up, as King David says in this Psalm. King David is Malchut that rises up solely and only because it gathers all of its parts. So we must organize an environment for ourselves that will support us during a time of weakness, just as we buy an insurance plan in case of some damage that we cannot cover by ourselves. There could suddenly be an auto accident and I would need to pay $10,000 for auto repairs. Where will I get this sum? But if all of us together gather $30 a month, because an accident like this doesn’t happen to everyone, then we would have money to pay for the repair if something like this happens to one of us. The same thing is also relevant to spiritual advancement. And we have not just the fact that we collected from all the friends in the group. Everyone falls during his particular time, so it is not merely the total accumulated by the friends, but much more. For at that moment, this is gathered and strengthened. But we don’t use this; on the contrary, we bring each other down. When we see that a friend is weakened, we must elevate him, as King David writes: “O come, let us sing unto the LORD; let us shout for joy to the Rock of our salvation”. The ascent begins from this. But if a reservoir of forces is not prepared in a group, it has no chance of advancing by the way of “I will hasten it” (Achishena). Question: What can be done if after we have checked the needs and the deficiencies of the friends, we see that we cannot help them, we don’t know how to fulfill their needs? Answer: So we pray, we ask for help. Question: How does one turn in the right way with a request, with a prayer, so that it will bring the Light that Reforms? Answer: For that you must enter into the friend’s problem as if it were your problem. Question: But I cannot change myself. Answer: Right, only the friends can change you. In the spiritual path, a person sees how weak he is. In the spiritual path I discover that I have “no hands.” I have no way of helping myself and I am completely at the mercy of my environment. If the friends want it, I will advance; if they don’t want it, I will not advance. So we reach true Arvut. To advance, I require a connection with friends. So I am ready to give them everything. And then vice versa: I no longer want anything for myself and don’t think about my advancement. Instead, I think about having the opportunity to support them, to help them. This is true Arvut. Question: How is it possible to correct the negative connection between people into a positive connection? Answer: The whole problem is in how to correct a negative connection between us into a positive one. If we were to succeed in arranging and determining a positive connection, then we would feel the higher power between us, and instead of the reality of today, we would see a reality that is completely full of Light, bestowal. This would be life in another, spiritual dimension. But we are in a shattering with respect to this condition of wholeness, in a form which is its opposite. All of our work is to go from the broken state to the state of wholeness. One vessel that was filled with Light was created at the beginning of creation. This state is called world of Infinity. But those who were in this world didn’t feel themselves as existing because the Light suppresses all differences and doesn’t permit feeling anything. For this reason the shattering was created, and everyone there discovers that there is no longer any Light. The Light disappeared from this world; it was removed and the world was left empty. 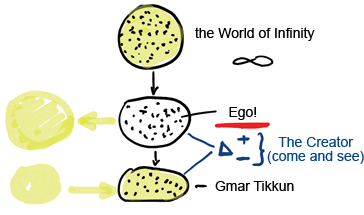 And now all parts of creation have become egoistic; ego is revealed between them! We need to bring the Light back so that it will again fill the world. This is our goal and this will indicate a state of the end of correction (Gmar Tikkun). But due to the difference between these two states, we pass from a negative state to such a positive level where we begin to understand and feel the higher power, the Creator. In the first state we were suppressed and didn’t feel ourselves at all, we were completely filled with the Upper Light, like a drunkard who gets so drunk that he loses consciousness and doesn’t understand what is happening to him. We are now in the second state and are beginning to feel how much we lack the Light, how much we lack the right connection between us. This is the crisis that the world is experiencing today. The Light gradually disappeared and now we are beginning to feel that we are sinking into darkness. And our next state is the beginning of the correction where we bring the Light back to a place to the degree that our souls will be ready to accept it and to attract it again, to the degree that we demand that the Creator be together with us. We need to vacate a place for Him, and for this we must remove our ego that takes up our entire living space. It is necessary to suppress it. So all of us together enter into the center of the group where we build relationships with each other that are like the Light. And according to this resemblance and equivalence, according to the law of equivalence of form between the Light and the vessel, the Light returns to our connection. All of this is very easy to understand and incredibly difficult to carry out. Traditionally, people sang melodies written by Kabbalists, in sad minor keys. But we must understand that every Kabbalistic melody is above the Tzimtzum, meaning above concern for oneself. All the melodies are directed towards the Creator with a yearning to adhere to Him with bestowal and love, to give Him contentment, and to resemble Him in one’s relationships to other people. They don’t express regret about the hardships and suffering, or complaints about the difficulty of life, as is commonly understood in religions. Concerns like these and the general sorrow of a person are not mentioned in the wisdom of Kabbalah and in the books of Kabbalah. This is because the Kabbalists are in a state that is beyond the Machsom, in the borders of the spiritual world; therefore, they take no account of themselves but only the Creator. And if they are sorry, then it is only because they cannot achieve more devotion and self-sacrifice for the Creator. All thoughts, desires, and expectations are directed outside of a person, and this should be felt in the melody. This song is an outburst and enthusiastic outpouring of the soul. If we sing a melody by Baal HaSulam, we must imagine his state and try to be as close to it as possible. Otherwise, we associate this melody with our physical state, to our crying and requests: “Give, give, give!” We transform the sacred into the profane. Question: In the future society, how will people behave who don’t have the strength and perseverance to attain the goal? Today they don’t even have the power to try to do something for themselves. How will they try to do this for others? Answer: These people will get strength from serving society and will use the strength for society’s benefit; they will feel immense fulfillment from this. Today they barely move because society doesn’t nourish them with strength, it doesn’t thank them, it doesn’t express appreciation, it doesn’t awaken them, it doesn’t warm or agitate them. Society simply doesn’t pay attention to them. If they were to begin to awaken the person, then everyone could invest a lot of energy at work. If this is a person and not a beast, then it is always possible to ignite him through envy, lust, and honor. It is necessary only to use these tools wisely. Ultimately, everyone will yearn to give society as much as possible. Question: But what is there to do if I am not like this? I don’t yearn to give to society! Answer: Nobody yearns for this today, and not just you! One hundred percent of people are like that, like you. Nobody is born with a desire to give to some stranger. Only crazy people can do it. But we need to show examples of the method that enables a person to discover the awareness that he will benefit a thousand times more from his connection with others. Nobody is required to sacrifice himself for the sake of society. If we give you the possibility of investing in a profitable business: However much you invest, you will receive a thousand times more. Is it worthwhile to invest or not? Certainly, it is worthwhile! This is an egoistic calculation. Nobody calls upon you just to love and to sacrifice yourself for others. It is necessary only to understand that there is a special force contained in connection. If we connect and unite for the good of all, then to the degree of his investment, each one will begin to receive interest, profits, and will earn much. You receive both material and spiritual satisfaction. Question: In what way is this satisfaction different from the satisfaction that a violinist gets from his concert today? Answer: Your current fulfillment is very limited: a little money and a little respect, this is all. It comes only from people, from how much they clap and cheer, from some positive review that is written afterward in the newspaper. If you give to society, then through it you begin to see the upper world, its eternity, its wholeness, its higher harmony and you are not just happy about earning another million, having the audience of a thousand people applauding and shouting bravo for you. You enter a higher level, a new world. It is impossible to convey in words the essence of that payoff; in this is the entire difference between a person and a beast. Now you are getting beastly fulfillment, but if you serve society, you will become a man. The five books of the Torah correspond to the five attributes a person has to reveal inside himself and correct. In these properties, he will reveal the world he really exists in. Instead of the fictitious corporeal world, he begins to see a different world and feel he actually lives in it, an eternal and whole world, while constantly expanding and attaining its internality. But all this happens according to a person’s development in the five spiritual senses. Each of the worlds characterizes the development of a certain basic sense, like the sense of feeling, for example, but they include all the other senses inside. Then the sense of taste develops, which includes all the other senses in it. Then come the senses of smell, hearing, and sight, which also include all the other senses. This means that every level, even the smallest one, is made of all five since there cannot be another feeling but the feeling that it is made of them. Thus, every part of the Torah is designed for the development of one major sense, but it includes all the others. It may first seem like repetition, but it isn’t so. For example, we can speak about the development of the sense of taste in the sense of sight and about the sight in the sense of taste, which complement one another. When a person feels an additional taste in a certain food, it becomes more attractive in its appearance. On the other hand, if he is given some porridge and he sees it in his uncorrected sight, he is disgusted with it, although it tastes fine. Therefore, there are differences in the stories of the Torah. But if a person still doesn’t understand what it is about, he may think that they repeat themselves: A certain tribe is wandering in the desert, and each time they don’t listen to Moses with regard to certain things. Everything is the same, the same scenery, the same characters, and almost the same problems. But because the main figure in the Torah is the Creator (that, in principle, is not present in any other book), it turns out that it attracts and captures all. It is an eternal book because there is force in it. No one with a developed imagination can create such a book that will attract people throughout the ages no matter how hard he tries. There doesn’t seem to be anything special in it but for ages no man can leave it. It may seem that the most powerful stories in the Torah are adventures full of action: The exodus from Egypt, the struggle of the people, the ten plagues, but suddenly the parts that are about ordinary actions, such as the giving of bread, incense smoke, etc., are not only filled with meaning, energy, feelings, but also begin to come alive in our senses. This is the paradox of the Torah.